Fluorochemicals are extensively used for their water- and stain repellency. Waterproof clothing using highly fluorinated chemicals are over-engineered for consumers, building in unnecessary repellency to oil and other stains, when only repellency to rainwater is required, demonstrates new research by ACES and the University of Leeds, UK. The team, who recently published their findings in Journal of Cleaner Production, say effective alternatives to harmful fluorochemicals used in waterproof clothing are readily available but are being resisted by some manufacturers and retailers. “Until recently the best option for making well-performing and durable outdoor garments were fluorochemicals. But high end brands were facing the problem that alternative repellent chemistries did not work well enough in the beginning to satisfy a consumer who can pay up to 500USD for an outdoor jacket. When pressure on the use of fluorochemicals increased by regulation and the media, chemical manufacturers saw potential in developing better alternatives,” says Steffen Schellenberger, PhD student at ACES and co-author of the paper. He continues: “When it comes to rain repellency, some non-fluorinated compounds have become competitive alternatives to fluorochemicals”. In this collaborative research – the most detailed study of its kind –, a survey of 300 outdoor clothing users revealed that most consumers only look for water repellency from their gear, not stain resistance. In addition, Steffen Schellenberger and his colleagues in Leeds developed an innovative “roll-off” method that assessed repellency with movement, which more accurately reflected clothing as it is worn (video). When they applied different waterproof finishes to measure repellency to a wide range of fluids – water, orange juice, red wine, olive oil, synthetic blood and gastric fluid, and cough medicine – they found that fabric treated with non-fluorinated repellents was resistant to water-based stains such as orange juice and red wine, but gave no repellency to oil-based stains. When it came to medical fluids, non-fluorinated repellents showed some resistance to synthetic blood and cough medicine, but none for gastric fluid. The researchers concluded that while fluorochemicals were shown to be the only effective option for clothing worn by medical staff to protect against infection, and by military, firefighting or oil and gas industry personnel seeking protection against chemical contamination, non-fluorinated alternatives were a viable option in all cases where stain repellency was not an essential requirement. “The advantage of using non-fluorinated chemicals in outdoor garments is that they have demonstrated good functionality but a lower environmental impact. Some of these new alternative technologies are based on biodegradable chemicals that, unlike fluorochemicals, would not persist in the environment,” says Steffen Shellenberger. The paper points out that the textile and clothing industry uses a quarter of all chemicals produced globally and is known to be a large contributor to environmental pollution. 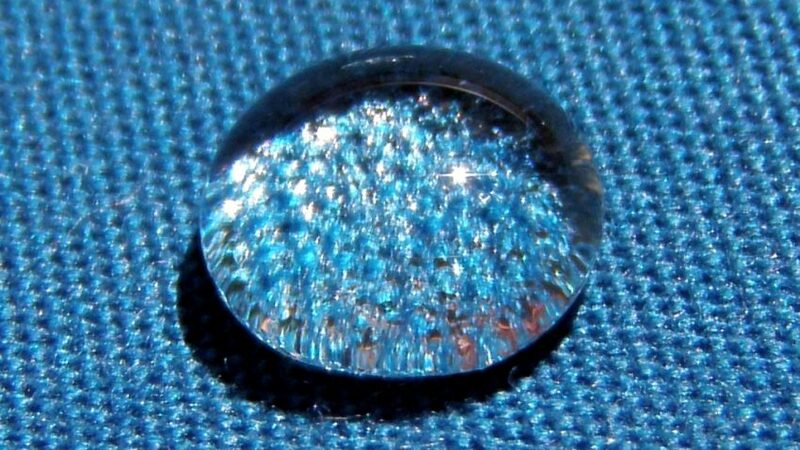 Moreover, concerns have been raised about waterproofing fluorochemicals finding their way into the environment during the life of a garment – through washing and microfibre shedding – and when it is disposed of.